Wings and Crostini: Unlikely match made in heaven! | Small, but valuable. Wings and Crostini: Unlikely match made in heaven! Okay, so I missed a bit of the “behind the scenes” info on the awesome ribs the other day, but it luckily applies to today’s recipe gem, too… It turns out that we have a whole lot of one particular batch of homebrew (beer). In order to use some of that beer for non-drinking purposes, Scott dove headfirst into recipes that use beer. 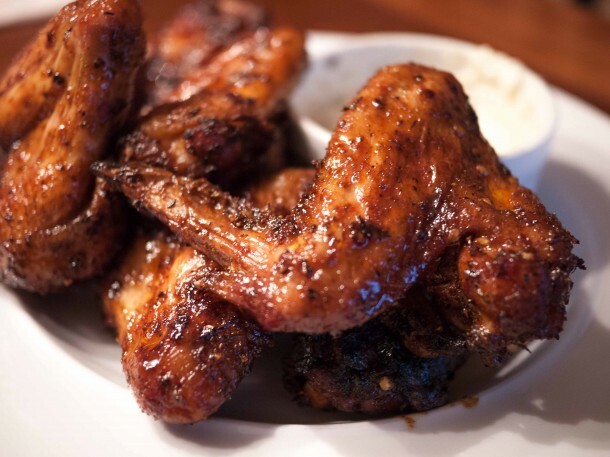 And thus, I give you the best wings I’ve ever eaten: CraftBeer.com’s Honey Chipotle Beer-Braised Wings. I don’t really love wings. I don’t even pick them out most of the time if I’m at a restaurant that specializes in wings. I think it’s because wings are messy, and I don’t want to use a napkin as a drop cloth in public. But honestly, if somebody gave me these wings in public, I would eat them in a heartbeat. I would even eat these in public with a white shirt on (the mess magnet of all mess magnets, in my experience). They’re just that good–incredibly flavorful, crispy skin! What more could you ask for in a chicken wing? And now it’s time for a minor confession. Scott and I aren’t great at putting together meals that have a cohesive theme. 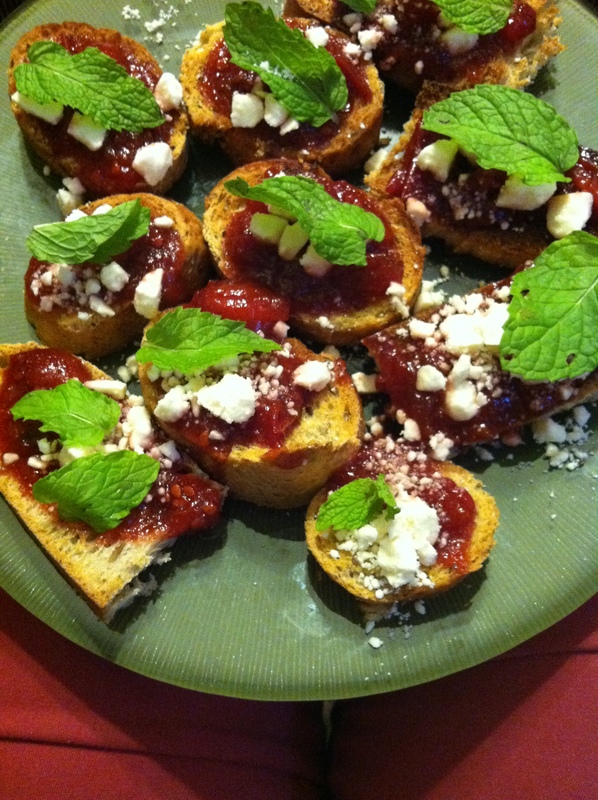 We just like food, and we don’t always care if the menu is “traditional.” Which brings me to the other thing we ate for dinner last night: Giada’s Strawberry-Tomato Jam Crostini. Yes, that’s me hoarding the crostini while sporting some very color-coordinated pants (accidental pants/jam coordination). Scott accurately pointed out that this crostini recipe tastes more like dessert than an appetizer, but it’s still super tasty. It was a great way for us to use some early summer tomatoes and some frozen earlier-in-the-summer strawberries without eating a plate full of raw tomatoes.